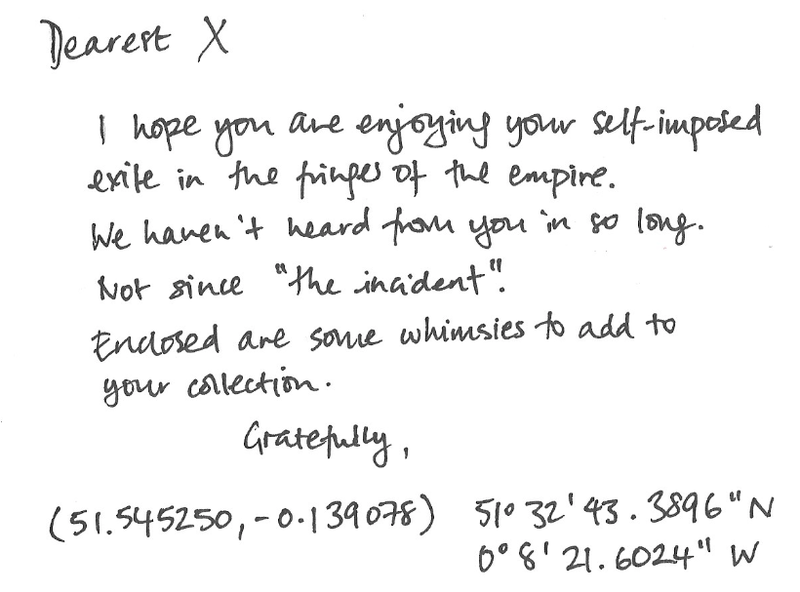 I received, in last week’s mail, in trust for delivery to X, this letter from Berfrois. The note above refers to this communiqué, from X to Berfrois. 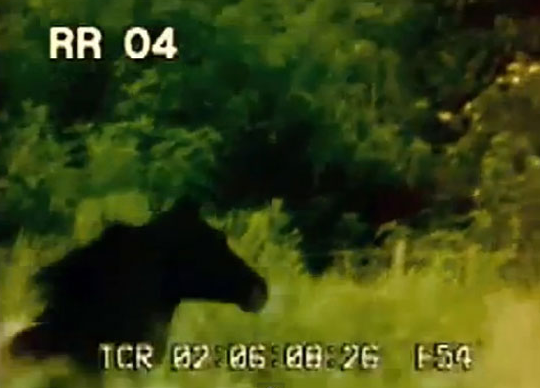 And the background to all this is an outlandish, “first-frame-of-each-shot-of-Lana De Rey’s video ‘Carmen'”–submitted through a close intermediary of mine on behalf of X to Berfrois. Between the Absolution novel and the next, looming letter from X it’s all given rise, as Julia Kristeva once wrote, to a feeling of “perpetual danger.” I’m still feeling around in the dark for the escape hatch. 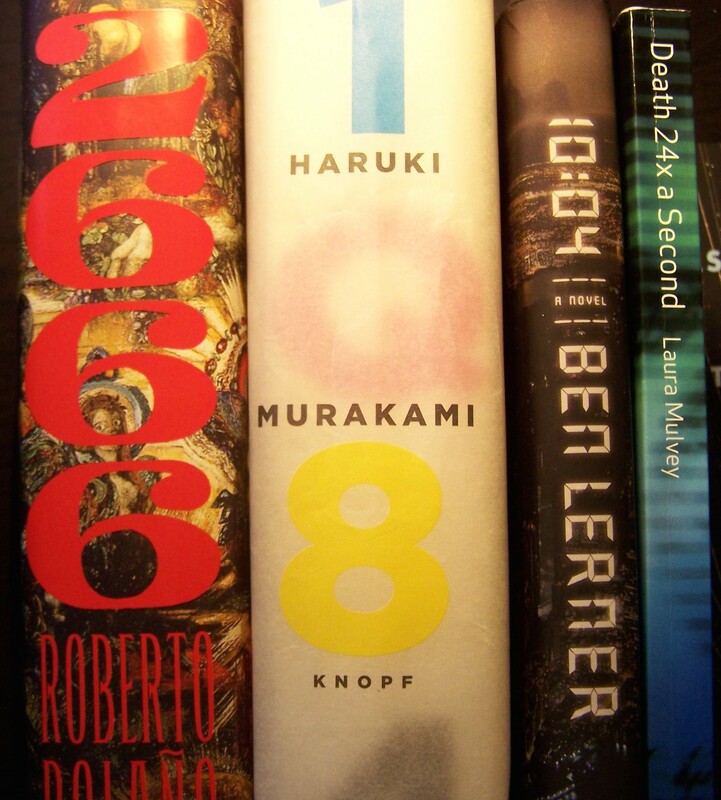 After class the other day, a student told me she had finished reading “twenty-six sixty-six.” It took me a moment to process that she was talking about Roberto Bolaño’s novel. I had mentioned Bolaño in class. It got me thinking: how do you say the title of that book? “Two six six six” or “twenty-six sixty-six,” as she had said? Does anyone pronounce it “two thousand six hundred and sixty-six?” I’ve always thought the 666 offers a natural pathway to pronunciation, but who knows. Ben Lerner’s 10:04 is straightforward: “ten O four.” Or maybe not? For some reason I think of the phrase as “death at 24 times per second” and so read that into Mulvey’s title when I mentally conjure it. 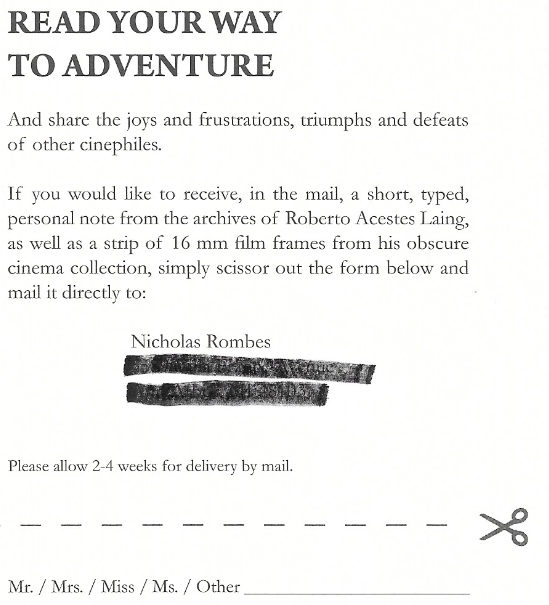 One of the nicest side effects of the publication of The Absolution of Roberto Acestes Laing has been the response to the “Read Your Way to Adventure” form at the back of the book, which invites readers to cut out and snail mail me requesting some ephemera from Laing’s archive. I didn’t know what to expect, and I’ve been happily surprised, with mail coming in not only from the U.S. but from the U.K., Spain, Canada, Peru, The Netherlands, and Japan. These provide a real connection to real readers. The Laing archive is far from exhausted, so keep them coming. The form from the back of the novel. 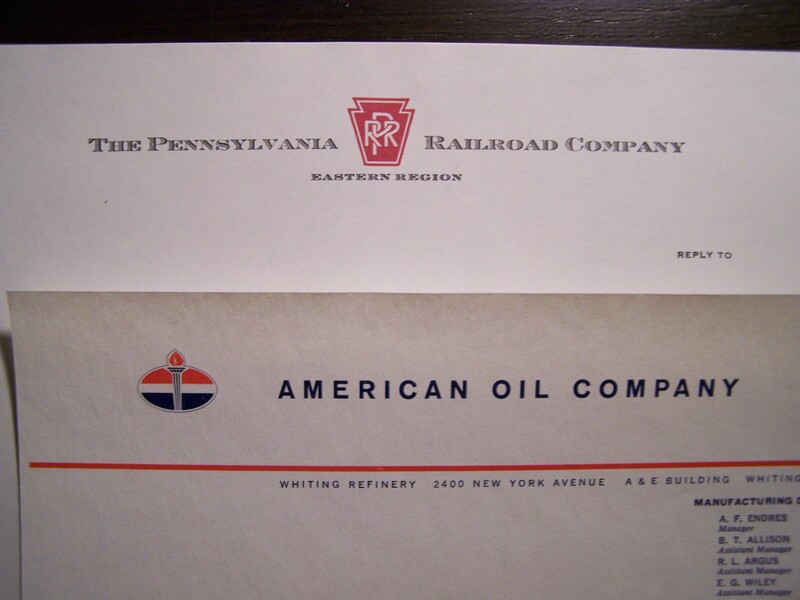 A sampling of some of the letterhead on which I type responses to readers. “You might also be stopped in your tracks by phrase-making I doubt could have been produced by anyone else on earth.” A belated thank you to Greil Marcus for this, about A Cultural Dictionary of Punk, which originally appeared (the Marcus thing, that is) in the October 2009 issue of The Believer. 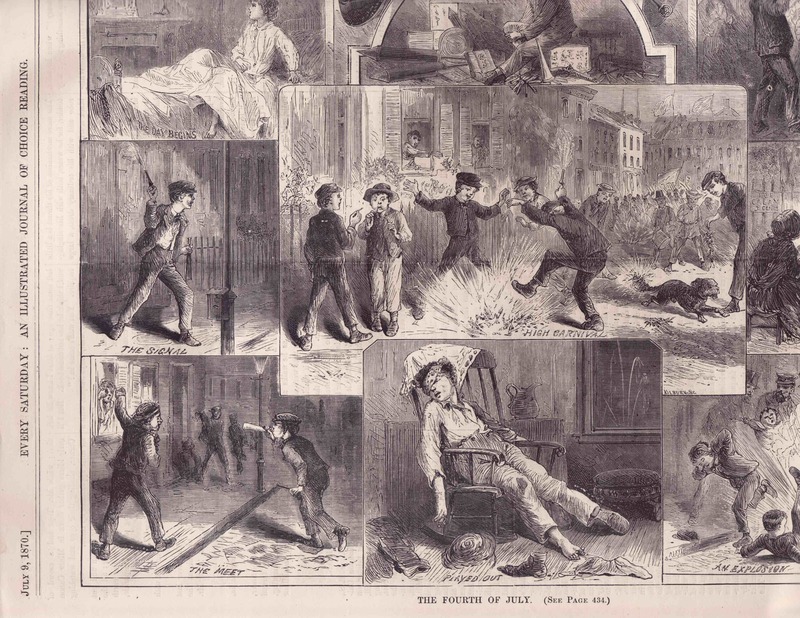 A few years ago I wrote a doomed but sort of fun column over at The Oxford American called “Panel Busting.” One installment looked at a few nineteenth-century cartoons and their relationship to the development of early cinema and since then I’ve been picking up copies when I come across them of such illustrations/cartoons/comics. 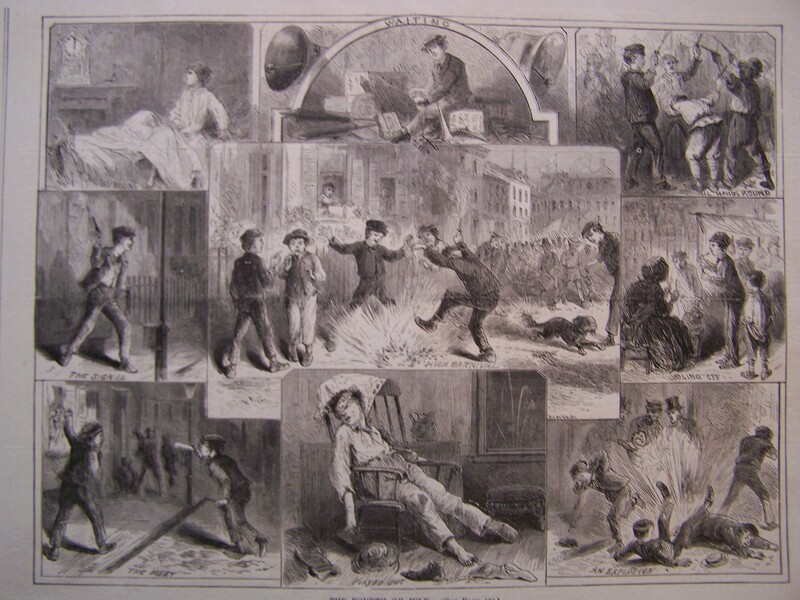 The one below is from a July 1870 copy Every Saturday, a short-lived periodical. I’ve scanned the full page (14” x 10.5″) as well as higher-resolution segment. Depicting the time leading up to and the time immediately after Fourth of July antics what’s interesting is the non-linear portrayal of these frozen moments. 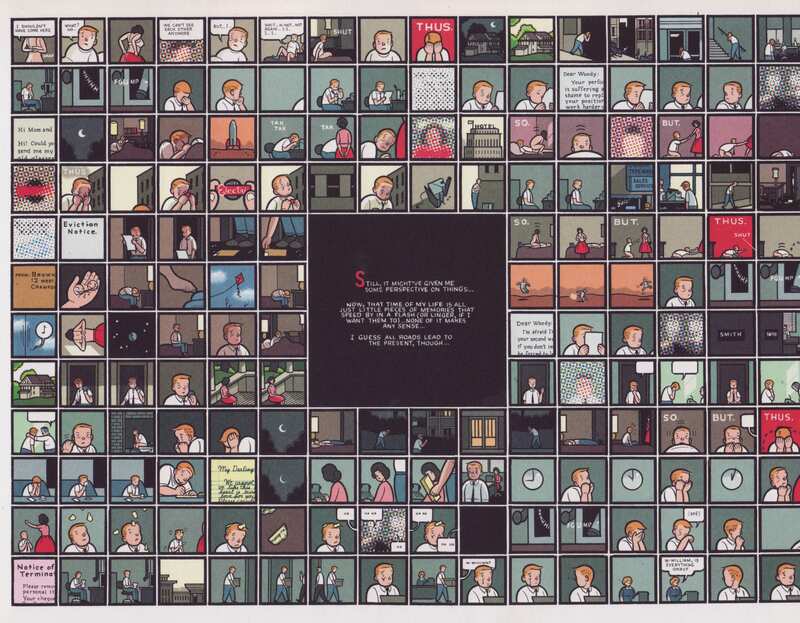 The highlight of the evening is centered on the page, surrounded by moments from the day beginning with “The Day Begins” (upper left panel) and ending with “Played Out” (lower center panel). But the moments in between seem undirected–the reader doesn’t seem to be visually directed to look at/read the panels in any particular order. Reading from clockwise from upper left doesn’t make any sense, and neither does reading (as we would today in “comic strips”) sequentially from left to right starting at the top left panel and ending at the bottom right panel, as if reading prose. What is the relationship between cartoons and early cinema during this era? In what ways did cartoons become increasingly sequential as a result of the inescapable linearity of cinema? 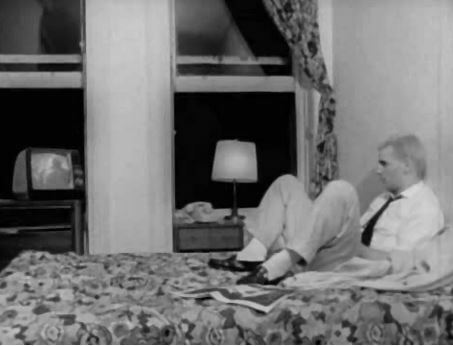 For no matter how “out of sequence” a film’s depiction of narrative is–whether through flashbacks or parallel editing or dream sequences–it still unfolds on the screen and is perceived by the viewer as a sequence. Until the advent of home viewing technologies it really wasn’t possible for an audience to experience a film except as a sequence of images whose duration was the length of the film. This is radically different, say, than experience the Fourth of July illustration, which a viewer could choose to read in any sequence she wanted, and which could last for seconds, minutes, or hours, or as long as wanted it to last.